An event in association with the London Month of the Dead at London’s Brompton Cemetery. In March 2014, British comics lost one of its most innovative and and original voices in the form of Steve Moore. The father of 2000 AD‘s Future Shocks, Steve gave life to a host of memorable characters including Laser Eraser and Axel Pressbutton for Warrior, and the psychotic Dalek killer, Abslom Daak for the Doctor Who Magazine. 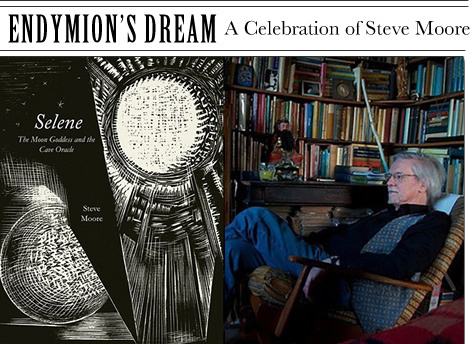 Steve was also the author of the acclaimed novel Somnium (“A unique work by a unique genius”, Michael Moorcock) and the satirical dark fantasy collection Tales of Telguuth, both published by SAP. Join us at Brompton Cemetery Chapel to mark the publication of Steve Moore’s final, posthumous book, Selene: The Moon Goddess and the Cave Oracle, an examination of the origins, dream-explorations and mystical practices centred on the Greek deity Selene. The life of Steve Moore and the enduring mythology of the moon goddess will be discussed in conversation with Steve’s close friend and regular collaborator Alan Moore, the legendary author and graphic novelist, John Higgs, the author of Watling Street and editor of Selene and Andrew O’Neill, the comedian and author A History of Heavy Metal. Until his death in 2014, Steve Moore wrote comic books, novels and nonfiction, including a study of the I-Ching, ‘The Trigrams of Han’, a critically acclaimed novel, ‘Somnium’, and a count ollection of short fantasy stories, ‘Tales of Telguuth’. He also had a long-standing editorial connection with ‘Fortean Times’, to which he was a frequent contributor from their inception.